Yes, you’ve heard it right! Cebuanos will soon witness a stageplay performed by international artists from the widely-known mainstream theaters of West End, London. This seems too good to be true but this is really it! 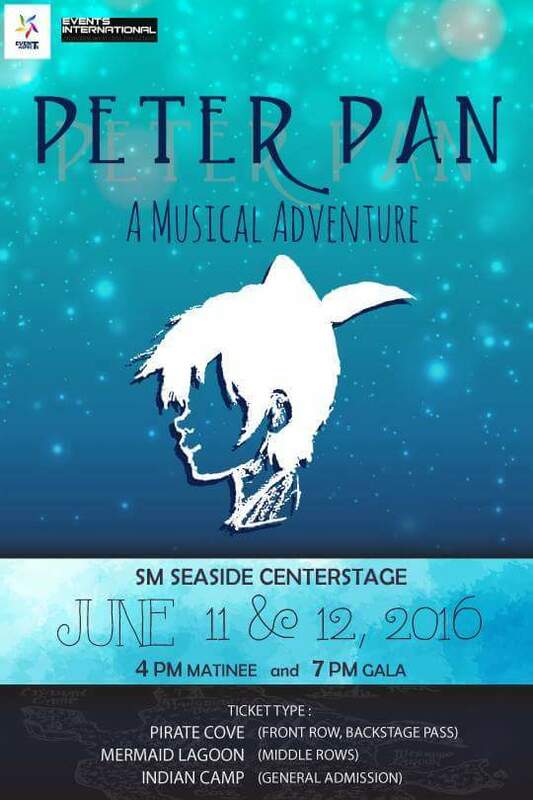 The performers will set foot in Cebu this June 11 and 12, 2016 at SM Seaside-Centerstage, for a musical portrayal of the story of Peter Pan, entitled “PETER PAN: A MUSICAL ADVENTURE”, directed by the highly-experienced, executive producer-director, writer, marketer with wide exposure to performance events staged in theme-parks, formal theatres, open-air and street– Mr. Paul Hammond. This will be its first Philippine staging. Exciting! This event is headed by Events International, a production company that has brought international concerts and stageplays across the stages in India, Thailand, Vietnam and some parts of Europe. They have promoted musicals from the US and UK such as “Barefoot in the Park”, “Cats”, “Ain’t Misbehavin”, “Evita” and “Mousetrap”. As the company is still on its ongoing journey in providing entertainment, they decided to mount “Peter Pan” in the Philippines and luckily, Cebu, in particular. Events International is currently in collaboration with Event Aspects, a local production company that coordinates and manages corporate and artistic events. This event has long been planned and with careful and thorough processing, the collaboration finally laid all the cards on the table. So for all theater enthusiasts, children of all ages and for everyone else who once met Peter, Wendy or Tinkerbell in their dreams, please keep posted for further details.